I am really lucky that nearby our home is a large fruit orchard and farmer's market where they sell all kinds of organic fruits and vegetables. Every year I visit several times and pick up fresh produce to freeze and can for wintertime use. Recently I headed to the fruit orchard and got a great deal on several different fresh fruits and combined them to make a homemade fruit cocktail which I canned. Depending on the size of your fruits...this home canning recipe will make 6-8 pint jars or 4-5 quart jars. 6 to 9 lbs. fresh fruit (green seedless grapes, peaches, pears, cherries, pineapple, nectarines and yellow plums are what I use). Prep: Wash fruit under cold running water, drain. Peel fruit and remove pits and/or seeds. Cut fruit into 1/2" chunks except for the cherries and the grapes. I love the combination of fruits you were able to obtain. 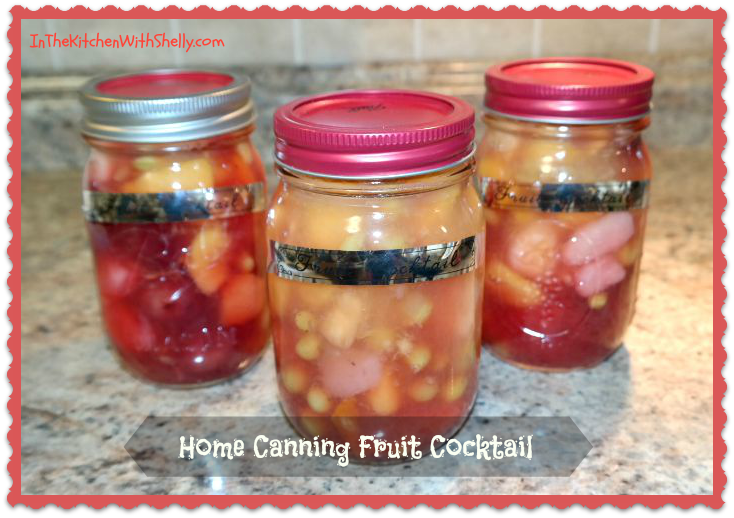 every time I read one of your canning recipes I tell myself that I have to start canning. There is a sal on Ball canning glass jars at my hardware store.